My four-month summer capsule (it’s the weather, not me, making the rules) has less than three weeks left. Not all of its 35 items have reached the magical at-least-10-wears-per-season but they will get there. This is becoming an curiously anti-climatic numbers’ game. Of course I can make 35 x 10 = 350 wears happen in 126 days taking into account that an average summer outfit consists of two to four garments and there are many days when I wear more than one. The only chaos-inducing event was the revision of my Riga capsule. Some items went out after just one or two trial wears while some changed homes and moved to either Riga or Barcelona. But by now everything that got added to the excel is getting its 10 wears. Oh, and the little blue heirloom blouse is up for grabs! May its journey be long and wonderful. The gray cardigan (hand-me-down from my mom, 39 wears) has been living at work and protecting me against the air conditioning. The revived Street One military jacket (bought new ~2006), after a long sleep in a glass coffin in Riga, so far has seen mostly planes and travel, not so much everyday life in Barcelona. Also both of my shorts have been worn more than enough. This is a source of additional joy, as it indicates a very healthy turn in my relationships with my body. Due to some very stupid ideas about “fat wobbly thighs” I wouldn’t wear any between the ages ~9 and ~24. 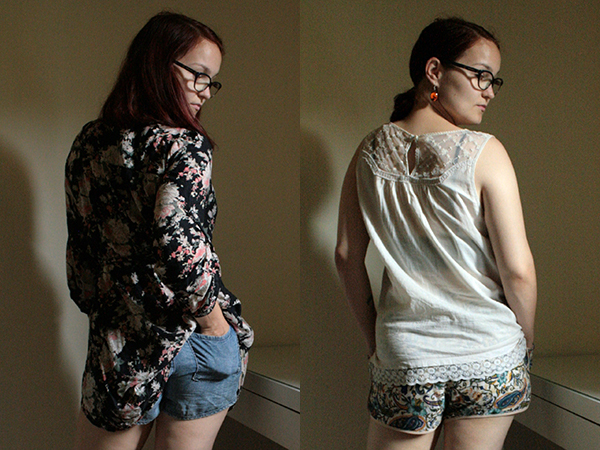 I’m glad that’s over because shorts definitely are the easy summer garment, especially when as comfy as the floral rayon shorts (hand-me-down from my mom, 22 out-of-home wears). I’ve been wearing them as outerwear, lounge wear, and underwear. Comfy and versatile is how I love my garments! Preparation for Kristīne’s wedding lead to a discovery how Arcopedico shoes can be fixed for my feet with a couple of silicone heel liners, so now they are full members of the versatile shoe team. Before that I could only wear them for short bursts at work. Changing footwear at work is something I just have to do, it’s a hygiene thing and a mental switch. Eastern/Northern European heritage ftw! Latvians are obsessed with indoors-outdoors shoe switches, my favorite part is seeing women in theater or opera getting out of their winter boots and changing into party shoes. Birks is this season’s incoming and I love them. However, I’m surprised how not made-for-walking the famously comfy shoe is! So nothing has replaced Vejas for biking (I like to pedal without worrying about losing my shoes) and casual 3+ km walks downtown. I get serious feet blisters if I do that in Birks. There is a (fashion) solidarity and significantly lowered thresholds of “yuck” in weather extremes. When it’s crazy hot you are sweaty and disgusting but so is everybody else using this metro. After years of suffering chub-rub, here are ways how I prevent it: (a) by walking less; using the bike instead has been my alternative of choice as public transportation induces even more anxiety during a heat wave; (b) by applying some magical dust generously; my dust of choice being Lush “Silky Underwear” mixed 1:1 with cornstarch; (c) by choosing your garments wisely; instead of cooking my body parts in biker shorts I prefer my extra flowy silk maxi skirt. They move between my thighs as I walk and have saved my from “I can’t walk any further” moments this summer. And, yes, I have had such moments in my life! Necklaces choke me. The do not come to me naturally in winter and even less so in summer. If I’d be perfectly honest, I’d have got rid of them long time ago. But I love the idea of necklaces, I love how they look, but often I take mine off before the day is over… so the struggle is stupid and real. Due to a miscommunication with the amazing ladies that normally take care of my unwanted body hair, I ended up going to the biggest European sociology event with all the possible hair on me. August in Athens, so no opaque tight tricks! And it went perfectly well. I decided not to care and the whole non-experience just confirmed that nobody notices or cares. Trying to dress weather appropriately in July and August lead to a clash with my mental hang-ups about work-appropriate clothing. These are totally self-imposed as I do not teach or deal with people in general. I share the office with several colleagues but it has been clear since the very beginning that there is no dress code. So it’s just about cockroaches in my head. Big fat cockroaches whispering that kaftan or short-shorts are not a good idea even when the premises are empty and, obviously, nobody cares! What have you learned this summer? What will you do differently with your 2018 summer capsule?